Named Boat Of The Year by Cruising World magazine, this model offers 3 very spacious cabins, a settee in the owner's cabin that can be converted into a separate cabin with 2 upper-lower singles. This model has 2 large heads, an L-shaped saloon to starboard, and a large cockpit with a dual helm and a functional cockpit table. 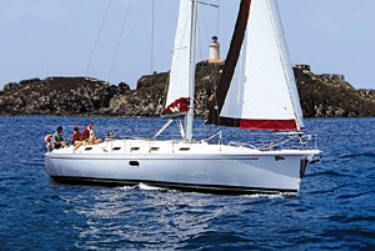 The Beneteau 423 accommodates up to 8 people in private cabins. 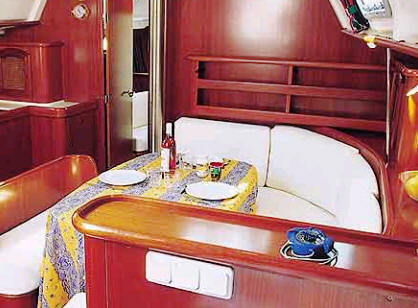 The master cabin is located forward and has a settee which can be separated to create a fourth bunk cabin. The master cabin has a private ensuite head and spacious shower unit. 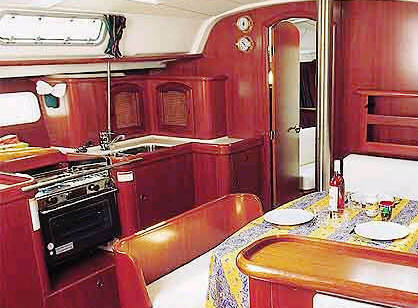 There are two more double cabins aft which share an additional head and shower. The Beneteau 423 has a large bimini, electric windlass, additional water capacity, dinghy with outboard, snorkeling gear, cruising guide, chart and boat briefing. Optional extras include a kayak, skipper, cook and a provisioning service.